When most of us think of a daiquiri, the image of a strawberry-infused frozen concoction in a hurricane glass comes to mind. But Ernest Hemingway and our dashing 35th President, John F. Kennedy, weren't sipping anything of the sort. They enjoyed a more refined daiquiri, and I promise you will, too! Combine all ingredients in a cocktail shaker with ice. Shake vigorously for no more than 10 seconds. Strain and serve straight up in a cocktail glass. Notes: If you can find it, the use of cane syrup in this cocktail is a lovely touch. We keep a bottle Petite Canne's Sugar Cane Syrup in the cabinet for just such purposes. Barbancourt rhum blanc is my personal favorite in this classic cocktail, but any white rum will do. For more complexity, use an agricole rum-La Favorite and Neisson are excellent choices. Your picture looks so pretty. 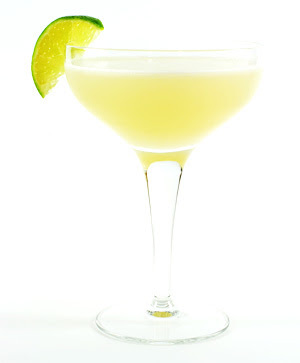 I have never made a Daiquiri ... will have to give your recipe a try! That looks luscious and refreshing. I definitely will try it! Yum!! :) Thanks for the tip! Jen, that is so sweet of you! Your quote blog is truly amazing, and I've been sending her little notes I think will make her feel better! Ladies, I think that after this week, a cocktail is in order! This sounds so yummy, I need to try this! Lena,my husband is fond of your ports about drinks and cocktails....and so am I!We will shortly try this recipe! Whata about Kyr Royal or Kyr Imperial? MMM...sorry...I meant of your posts....Am I drunk because of your faboulous cocktails???? Laura, I do love a good kir! I was a little drunk of Friday night, too!